“What did you write?” she sounded curious. Rudwig smiled at her and pressed the paper into another fold. “Are you done yet?” he asked her, while putting the folded paper into an envelope. “I thought I had all the time in the world”, she complained and buried her face back into the paper. They were on the green grounds of Welsa, under one of the large Palmigo trees. “But Willy will be here any minute. And I don’t want to include him in this game. This should stay between us, we two”, he issued his share of complaints. William was the other kid in the neighborhood. Rudwig had always insisted that Jenny should stay away from him. “But Willy is a nice g..”, she was trying to put forth her argument, but Rudwig’s upset looks didn’t let her complete it. After about five minutes, Jenny appeared content with whatever she had written. She looked at Rudwig and smiled. “The paper, put it in that envelope”, he instructed her while pointing at the envelope that laid next to her. After she pushed the folded paper into the envelope, he wrote their names on each of the envelope and sealed them in a plastic bag. He then put the sealed bag inside a large glass bottle and poured the blue colored liquid into it. “What’s that?”, the ten year old Jenny asked him. “I borrowed it from Uncle Hanks. He had told me that it prevents the paper from ageing and would keep it safe”, replied the eleven year old kid. He then closed the lid of the bottle and lowered it into a hole that he had dug up in the ground. The 4 feet deep hole had taken him more than an hour to dig. “So, what next?”, Jenny asked. “So, we meet here after ten years and then we shall unbury this time capsule. We will then read each other’s secrets clear and loud”, he said. “Ten years it is. Under no circumstances shall the capsule be unearthed before its time”, she giggled after making a loud announcement. “Ten years it is”, he adjusted his hat to suggest that he would keep the word. “Yes! Until then, my secret stays with me and yours stays with you. Nobody else should know the secret”, she smiled. “Yes. Nobody! Except the time capsule”, he added and both of them laughed. After two years, upon his father’s job transfer, Rudwig had to move to the city of Nuivenna. “So when am I going to see you again?” Jenny had asked. “In the summer break, I shall board the first train to Welsa”, he had promised. “You shall write to me until then, wouldn’t you?” she had asked. “Keep away from the city habits”, she had smiled after issuing the instruction. “And you..! You keep away from Willy”, he had laughed. Weeks passed and then months. They wrote to each other every second day. Rudwig shared stories from his new school, the life in the city and much more. Jenny wrote about her music classes, her new pets, how Willy fixed her bicycle and much more. They also discussed about the trending topics like newly elected president of United States – Grover Cleveland and about the arrival of Statue of Liberty in New York. Eight months passed and then all of a sudden Rudwig stopped receiving letters. He grew worried and wrote to her a couple of more times, but with no luck. And then, on one day he received a letter from her parents informing him about her untimely demise. She had died due to the yellow fever. He wept and wept for weeks. Her death had pushed him into a state of despair. In the break of summer, he caught the first train to Welsa. Upon reaching Welsa, he straight away went to the green grounds. He spotted the Palmigo tree under which he and Jenny had buried the time capsule. He wanted to read Jenny’s secret. He picked up a shovel and began digging. All of a sudden he remembered it- words from Jenny. “Ten years it is. Under no circumstances shall the capsule be unearthed before its time”, was the agreed upon word. That would be eight years from now. He refilled the hole and walked back. He promised himself that he would return after eight years to open the time capsule. Rudwig was in college now, pursuing his degree in art history. He had been waiting on his heels for the day he would be able to read Jenny’s secret. And when the day arrived, he rushed to Welsa. Welsa was no more a town, but a large city. When he reached the green grounds, he was heartbroken. On the once green grounds of Welsa, now stood a large factory guarded by tall brick walls. “Welsa steel factory”, the board read. He knew where exactly the capsule was buried, for the old Palmigo tree was still there. Under the tree staring back at him was a large stone sculpture that stood as a pride of the factory. The capsule would be right underneath it, he knew. He thought of placing a request in front of the corresponding authority, to allow him to displace the sculpture and dig up the ground beneath it. However, he was appalled when he learnt that the factory was owned by Willy’s father. He feared that Willy might get to know about the time capsule and would try to break open the secret. He travelled back to Nuivenna. “A day will come when I get to read Jenny’s secret. That will be the day when I will be the owner of this land and this factory will be brought down to rubbles. I shall wait until then”, he had silently vowed. He began working as a clerk for one of the businessmen of Nuivenna, who was into railroad constructions. He quit his job after a few years. From the savings that he had, he started selling goods door to door. He sold items like perfume and other cosmetic products. All that he was trying to do was to gather enough money to buy Willy’s factory. In the year 1905, Vyzan – a neighbouring country had declared a war on Originia. The president had urged the Originian men to fight for the nation. Rudwig joined the army and participated in the war. After 3 long years of battle, Originia won. Rudwig was one of those two hundred brave soldiers who were honoured with the President’s medal. He travelled to Welsa during the snowy winter, to see if the factory still stood there. The factory was still there, but it had only grown larger. The tall brick walls were now replaced by steel gates, gates that surrounded a large acre including the old Palmigo tree. However, when William learnt the news of Rudwig’s arrival, he rushed to meet him. He told him how dearly he had missed Rudwig all these years. He kept asking him about the tales of war and heaped praises on him for fighting for the country. “How much would it cost me to buy this from you?”, Rudwig had asked after the tea, leaving William confused. “Why would you want to buy the factory Rudy? My father wouldn’t allow that”, he had replied. “You have built your empire on something that’s dear to my heart. Let it take years and decades. But a day will come for sure, when I will own this”, Rudwig had uttered those words. Upon returning to Nuivenna, Rudwig invested the savings from his earlier business and his military rewards into the ferry service that a friend of his had started. The business took off really well and earned Rudwig a good fortune. He bought a low cost ferry and started his own small scale cargo service. Very soon he had competitors – William one of them. William had ventured into the business of Cargo shipment and had vessels of all sizes. Rudwig’s business started shrinking and his aversion towards William began growing the other way. With every day passing William’s business grew only bigger. He had ventured into multiple business lines varying from health care to automobile, retail to real estate. With whatever money he had, Rudwig left to Cercia, a neighbouring country. It was a poor state, fighting its socio-economic adversities. Rudwig bought a farm land and in parallel began a small money lending institution. He began cultivating fiber crops and had the borrowers working for him in his land. His cotton exports grew bigger. Few years later, he stopped exporting raw cotton and decided to start his own cotton mill. His business grew, but he was still not in a position to buy the steel factory from William. William had turned into a powerful businessman and was counted amongst the riches of Originia. Rudwig developed thoughts of expanding into a new vertical. He discussed with the state, the need of owning military weapons and that manufacturing them would be a low cost affair than importing them. With the state aid fund, Rudwig built defence machinery plant. For ten good years, his company continued manufacturing arms and sold it to the government. In the year 1914, the Great War broke out between the great economic powers. William, who was one of the most influential figures in Origiana by now, had urged the President of Origiana to promote peace amongst it’s neighbouring nations. The President invited his neighbouring countries including Cercia to sign a peace treaty. Under this treaty, the countries were required to stay away from the war and had to stop investing in military weapons. The President of Cercia signed the treaty and the government stopped its defence investment with an immediate effect. Rudwig had to shut down his weapon manufacturing plant. He understood this as a tactical game play by William to ruin his business. The Great War stopped in the year 1918. Over the next five years Rudwig tried running various business but with no great luck. Rudwig was fifty and unmarried. His lifetime goal had turned into bringing William to ruins, and to buy his steel factory. Rudwig had believed that it was William who had stood between him and the secret of Jenny hidden in the time capsule. A secret for which he was longing since years. He started a small scale steel plant in Cercia. However, the quality of the ore available in the lands of Cercia was low, it didn’t flourish. He then re-began his money lending institution, this time at a larger scale. Over the next ten years, it grew into becoming the largest bank in Cercia – “J.R bank of Cercia”. The sixty year old Rudwig, travelled to Welsa and met William. William was preparing for the presidential elections. “How are you doing Rudy?”, William had greeted him. “I am doing good. Good luck with your elections Willy”, he had wished him luck. “I assume you are here with an offer to buy my factory”, William had smiled. Rudwig understood it as William’s attempt at mocking him. “No.! Not now! Not before you are forced into selling it to me”, he had said. “Oh.! Rudy..! You could have it. I will be more than willing it give it away for you, as a gift”, William had offered. “Not as a gift Willy. I had told you, I will force you into selling it to me”, Rudwig had smiled after declining his offer. “But why not?” William had asked. “Good luck with your elections”, was Rudwig’s response, before making an exit. William won the elections and became the president of Origiana. Meanwhile, Rudwig exploited his financial stature to gain a stronghold across the political ranks of Cercia. He contested the next term elections and went onto become the president of Cercia. Over a period of five years, border disputes rouse between Origiana and Cercia. William wanted to initiate peace talks with Rudwig, but men in the assembly urged William to wage a war against Cercia. William put forth his refusal to do so and stepped down from the presidential position. The new president took over and declared a war against Cercia. Rudwig who had secretly revived the defence wing during his ongoing tenure, was well prepared for the war. The war lasted for six months and Cercia had managed to defeat Origiana. A month later, Rudwig travelled to Origiana with a feel of pride of having won the war. He wanted to visit William and tell him that the time has arrived for him to take over his factory. When he reached Origiana, he was devastated by the sight of pain and death of the people over there. He was heartbroken, for he believed that he was responsible for the sorrow of the country in which he once lived. “Jenny wouldn’t be happy, if she was alive”, he thought. The guilt swarmed over and he disappeared silently. No one heard from him for about a year or so. “Willy..!”, he was struggling to keep his eyes open. William had moistened eyes when he sat next to the bed on which Rudwig laid. They were in a hospital. “How did you get to know that I was here?”, Rudwig asked. “Rudy. !”, said William. “I think you need to rest”, he added. William’s grand kid brought a flower bouquet and placed it on the table besides the bed. Rudwig was battling his life after developing serious heart conditions. He had grown pale and weak. “Rest? That I would Willy, but only after I issue my apology to you, for having hated you”, he paused for a deep breath. “I need to apologize for all the agony that I brought upon the country”, he added. William held his hand firmly and smiled. “I stayed away from the war, because I was afraid of being a sinner. If I were brave, I would have stayed in the position. I should have protected my people either by preventing the war or by winning it. I did neither of those”. He continued, “War was inevitable Rudwig. If not you, somebody else would have done it. No matter the choice that you made, you stood by your people and that is what matters”. “ Oh.! Willy. !”, Rudwig was in tears. “You are bringing upon so much peace to the heart of a dying man”. William smiled through his sadness and so did his family. “If only you could do me one more favour”, Rudwig asked with a pleading eyes. “I have my assumption Rudy. Now you tell me, if I have assumed it right?”, William asked. “You could have all my wealth and all my fortune. I had earned it all for the only thing that mattered to me on this earth. For something that lies beneath your steel factory. Please let me have it and allow the man die in peace”, he sobbed while he pleaded. William’s son stepped forward. He had the glass bottle in his hand. He placed the time capsule next to the bed. Rudwig looked at William and then at the capsule in disbelief. He was looking at it finally. The glass bottle -soiled by the age, filled with pale blue fluid and inside which floated a sealed plastic bag. Rudwig had no qualms and complaints. He didn’t want to know how William learnt about the time capsule, for the only thing that mattered now was to read Jenny’s secret. He signalled William’s son to open the bottle for him. He took out the plastic bag and wiped it clean before handing it over to Rudwig. Rudwig opened the bag with his trembling hands. He took out two folded papers from it. “Our secrets”, he laughed in joy through his tears. “Of mine and Jenny!”. He opened them, but his struggling eyes couldn’t help him read. He handed them over to William’s son. “Could you read it for me, Son?” he asked. He nodded and opened the first paper. The words were almost faded and faintly visible. “Jenny is the most beautiful girl in the world and I love her”, he read it. “Ah! Ha ha! That is my letter! This is embarrassing. Wrote it as a kid”, Rudwig laughed while offering justification. William’s family smiled. “Read Jenny’s secret now, will you?”, he asked. William’s son opened the other paper. The words were not as faded as those in the other letter. “It says”, he paused and smiled. “Rudwig is the most handsome boy in the world and I love him”. “See.! I knew..!”, Rudwig had exclaimed in joy before breathing his last. William smiled through his tears. He was content, for having seen his friend die in peace. The day Jenny died; William had rushed to the green grounds. He had dug up the hole below the Palmigo tree and had unearthed the bottle. He had known about the Time capsule all along, he had watched Jenny and Rudwig burry the bottle under the tree. He had opened the letters and had wept hard after reading them. After slipping one of those letters into his pocket, he had torn a paper from his notebook and begun to write. Click here to read the first episode. “What are you up to? :)”, her text message arrived. The store was lazily filled with people who were busy posing as someone who is definitely going to make a purchase. “So this washing machine, would it work for sure?”, a customer in his late thirties asked me. He was accompanied by his wife. “Yes. Do you want to buy it?”, I asked. He looked at his wife and then at me. “I mean this specific piece that I am going buy. Will it work for sure?”, he raised his concern. “Getting entertained by customers”, I replied to Anahita’s message. “Sir. Would it work?”, he repeated the question. I scanned the floor for Customer Assistants- everyone was busy. “Yeah”, I kept my answer short. I wasn’t convinced that he was going to buy it.Yet I felt the need to add the following statement. “There is a warranty that we issue with the machine”. He didn’t appear as if he was convinced. “But, if we go back home and find it faulty, wouldn’t it be troublesome to raise a complaint?”, he asked. “Feeling hungry, stuck in class”, she had texted. “What would you love to have?”, I asked. “Sir?”, the customer interrupted me. I threw a questioning look at him. “What do you suggest?”, I tried to sound gentle. “Can’t we test the piece right here?”, he asked. His wife nodded , suggesting that it would be the right thing to do. Anahita – “Donuts 😉 “. I looked at the customer and while trying to conceal my displeasure, I said – “Well if you could hand me that dirty white shirt that you are wearing, we could test the machine. We could try giving it a wash, right here right now”. I didn’t even wait for his reply. There was something running in my mind. I picked up my car keys and walked out of the store – asking the store manager to take care of the showroom, before doing so. “Just come outside. Outside the college gate”, I repeated. “You must be kidding! I have my classes. They might mark me absent”, she tried to resist. “You are not in a school Anahita”. “Fineee!” she laughed and ended the call. After she had given me her phone number, it was all about good night, good morning and occasional phone calls. We had never really met. I wanted to meet her now and wanted to take her on our first date. “I am outside the college. Where are you?”, she asked. “What!”, that was her third ‘what’ in the day. “I have a mission for you”, I said. “What!” she had refused to stop uttering that word. “There is a note for you, stuck on the lamp post next to the gate”, I gave her my first instruction. She looked around in confusion and walked towards the post. When she found the note, she looked around again in an attempt to trace me. “The sun that sets in the east, is the one that was lazy to wake up”, I had written on the note. “It’s a critical mission Sergeant Anahita. You have been designated with the task of retrieving a package from one of our subordinates and delivering it to commander Jhin Xiu”, I spoke in a dramatic tone. “Sid!”, she took my name again – this time in a complaining tone. The very next moment it appeared as if she had begun to buy into my idea of role play. “Yes Sir. Where would I find him?”, she asked- like a man on a mission. “You need to walk a distance of about 250 meters towards south east”, I was trying to give her my instruction when she interrupted. “That I assume is towards the bus stop”, she said. I was taken aback by surprise. “Yes. Towards the bus stop. There you will find lieutenant Myuing Tsao from whom you have to collect the package”. “But how will I identify him?”. “He will be wearing a green shirt and a blue jean”. “That sounds cool!”, she laughed – mildly. “On the note is the passcode. Memorize it. Before handing over the package, he will ask for the passcode. You make a mistake and mission will fail”, I carefully instructed her. “Yes sir”, I guess she was trying to suppress her laughter. “Okay. Our men with snipers have marked you. If you try to run away from this, you will be shot dead”, I warned her. “No sir. I won’t”, said she in a stern voice and hung the call. I could now see her walking towards the bus stop. There were about a dozen passengers waiting for the bus. She spotted a man in green shirt. “Lieutenant”, she said after stroking him on the shoulder. The man in green shirt turned around and looked at her in confusion. “Lieutenant Myuing Tsao”, she repeated, this time in an uncertain tone. “Sorry. !”, the man replied with confusion. Passengers at the bus stop started staring at her. “Are you Myuing Tsao? Lieutenant Myuing Tsao?”, she asked him again in a scared voice. “What. !”, the man exclaimed. Few of the passengers laughed. She turned pink in embarrassment. “Sorry. !”, she apologized and immediately pulled out her phone and dialed me. “What kind of prank is this? I am feeling so very embarrassed. I mean people started staring at me. I guess I appeared a crazy woman”, she started ranting. “Passcode please”, she heard someone saying. When she turned around, she found the same green shirt guy. Vinod had managed to carry out the act impressively well. “Oh. !”, she smiled at him. “Hang on. !”, she told me over the phone. “The sun that sets in the east, is the one that was lazy to wake up”, she uttered the passcode with a gleaming smile. “Should be right!”, he winked and handed over a large carry bag to her. “Sir.! I have collected the package. Where should I drop it?”, she asked. “Sergenat! As instructed earlier you need to deliver it to commander Jhin Xiu”. “But where will I find Jhin Xiu?”, she laughed. She took a while to reach the park. “Well done. !”, I removed my glasses. She handed me over the package. “You have successfully completed your mission”, I greeted her. “What’s next sir?”, she asked. “Let’s have some food”, I replied. “Here”, I smiled and pulled out a donuts box from the package that she had delivered me. “Stupid!”, She laughed and quickly grabbed it from my hands. “How much did you say?” he asked. When Zylos heard the whopping amount that he will be paid for his work, it was difficult for him to believe that he had heard it right. “A hundred thousand Stellars”, came the reply. Zylos was the most renowned painter in town – earning his living by drawing portraits for elites. It was the country of Origiana in its late 1500s, ruled by Queen Ina. There were various tales that spoke of Queen Ina’s rise from a being a singer in the court to becoming the queen. She was married to prince Tyzar who went on to become the king. Upon his untimely demise, the baton was passed onto her – She became the ruler. The minister of the state was at the door of Zylos with an offer. A portrait of Queen Ina had to be painted and he would be paid a huge amount in return. “Zylos! Would you agree to paint the picture of her highness, Queen Ina?” the minister asked. The assignment was not something that would demand much of his effort. The money that he would be getting in return would would help him lead a life- lead by the rich. “But there’s a condition”, said the minister. Zylos threw a questioning look at him. “You can’t paint the picture in her presence”, he said. “You cannot expect her to warm her seat and pose, while you paint her. We would allow you to attend the court proceedings and you could stay there for half an hour. We would allow your visit every day until you are done”. “So you want me to memorize her face and continue the drawing once I am back home?” asked Zylos. Artistic genius that he was, drawing from memory wasn’t something that bothered him. ‘It might take some time, but not forever’, he thought. “That shouldn’t be difficult. Could be a matter of weeks”, he gave his nod. The minister smiled at him- “The queen will have a look at the painting. She would expect the portrait to match her beauty – every contours on face intact. Any flaw that she finds in it and you will not be paid for your work”. “So the money…” Zylos paused. “You will be paid after your work!” the minister smiled. Queen Ina was perhaps the most beautiful woman on the earth – at least amongst those women whom Zylos had seen. Every day he spent twenty minutes in the court looking at her – paying attention to every minute detail on her face. He was not allowed to carry any drawing material to the court, hence all his observations had to stay in his mind until he returned home. Once home, he would quickly try to put those details on canvas. He would spend hours on every line that he drew and every stroke that he made. Every day he would wake up early in the morning and stare at the canvas until it would be time to rush to court. In the court he would then spend time in identifying those details on her face that deviated from his painting. Weeks rolled and then months, but the painting wasn’t complete. Ones which were complete didn’t appear perfect to him and he had them thrown away only to start with a new canvas. He tried to distance himself from others. He stopped talking to those around. He kept thinking about Queen Ina’s face all the while. One day it occurred to Zylos – ‘My wife is also beautiful. She might be someone who is serving as my distraction. While I draw Queen Ina, it must be my wife’s face that is invading my memory every now and then’. The moment that thought crossed his mind, he started avoiding his wife. He stopped looking at her, with a fear that it would influence his painting. He burnt all his wife’s portraits. Her husband’s behavior started bothering her. She turned ill and one day she passed away. However, her desertion had little impact on Zylos. He continued painting the portrait – all day and all night. Few more years passed by and Zylos was yet to paint a portrait that satisfied him. He kept visiting the court and the minister kept enquiring about the progress. The desire to paint a perfect portrait had turned into an obsession! The neighboring kingdom Vyzan had declared a war on Origiana. The battle was fought. After four weeks of war Origiana lost. Brave lady that she was, Queen Ina was one amongst those countless warriors who had lost their lives in the war. Every royal belongings including the palace was destroyed. The king of Vyzan took over Origiana. Few more years passed by. Now Zylos had turned old and was in his fifties – leading a lonely life. One day a carriage stopped by his hut. A bald man of almost his age stepped out of the carriage. His attire and the badge that he wore, suggested that he was a senior official in the court of Vyzan. “Is this the place where Zylos, the painter lives?” the bald man asked. Zylos took a moment and nodded. “Are you the one who was working on the portrait of Queen Ina?” he asked. “Yes”, said Zylos in a shaky voice. There was a sharp change in the bald man’s expression. He was visibly excited. “Well. Do you still have any of her paintings”, the official asked, with a hint of anxiety in his voice. Zylos didn’t reply. Instead, he took him inside and pointed at a huge pile of paintings – covered in dust. He picked up a cloth and slowly started dusting them before arranging them on the floor one by one. Every picture in the pile was the portrait of Queen Ina! Painted with perfection!. When the last piece was dusted and laid on the floor, the bald man stopped counting. There were around a thousand of them! “Beautiful!” he exclaimed in a voice that choked. Zylos responded with a forced smile on his tired face. “Why have you painted so many of them, a thousand ?”, the bald man asked. “I don’t know”, Zylos replied softly. “I am buying them, all of them”, said the bald men- gently. Zylos was taken aback by surprise. “One million Stellars”, he said and held out a large leather pouch towards Zylos. The artist was at loss of words. All his old memories rushed in. Tears rolled down his cheeks. With a shaky hand he touched the pouch and with the other he wiped his tears. The bald man signaled his men and they started moving those paintings to his carriage. When he was about to leave, Zylos asked the question that had made nest in him all this while. “Why pay so much for her painting?” he asked. The bald man stopped and turned around. He came closer to him and started speaking. “I was born here and was in this town until I left this country at the age of seventeen. Until then I used to look at her daily, listen to her sing by the river bank, dreaming of my future with her and thinking of ways to talk to her and confess my love. I left this country in a hope of making it rich and returning one day, being someone who could ask her hand in marriage at ease. But I am returning now, after a gap of thirty years. So much has transpired in these thirty years- struggle, war, longings and at last a comfortable life. My love towards her stayed persistent, but I couldn’t recollect her face anymore. I forgot how she used to look. All these years I yearned to see her face and when I am here, she isn’t. She is not alive”, he stopped as his voice choked. Pointing at the leather pouch in Zylos’ hand, he continued “This money is the least that I could pay you. The joy of seeing her face again and bringing alive her face that had faded away from my memory, is of worth beyond any measure”. He silently thanked him and proceeded towards his carriage. When He was about to step into the vehicle, something struck him and he turned around. “You live alone here. Aren’t you married?” he asked. “My wife, she died years ago”, said Zylos. “I am sorry”, the bald man apologized. “But you are an artist. You could draw her portrait and keep her alive”, he smiled. Zylos didn’t respond and waited for him to leave. Once his carriage left, he walked into his hut.He mounted a fresh canvas on the wooden easel and took out his brush. He tried to recollect his wife’s face again- like he did every single day! And as always, all that he could remember was – Queen Ina’s face! If you don’t want me to spill it for you, stop reading this any further. Go back and give the story, a second read. If you want me to explain it to you, then just think- why did he paint over a thousand portraits of the queen? Was he drawing them intentionally? And wasn’t he throwing away every picture that failed to satisfy him. Did he continue to paint the Queen in spite of her death? What were those last two lines in the story trying to convey? If you still haven’t understood it right, try reading the story once again. All that I was trying to tell is that there is a possibility that he had stopping painting the queen a long back. He must have been trying to paint his wife, because he had begun to miss her. Sadly, he had forgotten his wife’s face. And whenever he tried to remember her face and paint her, all that came into his mind was the face of Queen Ina. That’s how, a thousand pictures! At the end of the story, it was not Queen Ina’s face that fetched him the money. It was his honest attempt at painting his own wife’s picture. After the bedtime story, she urged him to take her there, to the place where she could see the rainbow. To a kid who had never seen a rainbow, her dad’s description about it while narrating the story, sounded magical. “I want to run my fingers all over those colors- violet to red. Just like that princess in the story”, said Purple. Her dad kissed her a good night and promised to take her there the next day. She went to her school. “Evening, after the school?” she had thrown a reminder before jumping into her school van. He thought for a while and decided to skip his office. He threw away his bag and drove to a store next street. “What’s all this? Aren’t you going to office?” his wife asked him, after seeing him return with a large bag of colored papers, paints, balloons and much more. “Charge our handy-cam. When purple returns from the school, she will be caught with a surprise. I want you to capture that entire episode”, he grinned and went straight towards the backyard. He painted those papers, cut them into ribbons and pasted them together. He Hung them all over the backyard. He dipped the brush in the paint can and splashed colors on the garage wall. He filled air in balloons and tied them to lamp posts. “What are you up to?” asked his wife, seeing the mess. “It’s the rainbow land. Can’t you see? When Purple returns from school, you should see her face”, he spoke in excitement. He braved the sun and worked until he was done. When he was done, it was half -past three. “What do you think?” he asked in all excitement. His wife looked at the backyard and the garage that stood there. ‘That’s a bad effort’, she thought. “It’s beautiful”, she widened her eyes to appear convincing while floating the lie. “In half an hour, she will be here”, he said. He was yet to complete his word when he felt a drop of water falling right over his nose. He looked upwards, at the sky. In no moment, dark clouds seized the sky and sun went into hiding. It started raining heavily – right from the first drop! He stood at the backdoor, silently watching all his efforts getting washed away. It rained and rained and rained! His wife served him a hot coffee. “That’s okay. Purple will be happy to know that you had tried your best”, she said. “She’s a kid”, he looked outside, through the window. The clock rang four and the school van arrived. Her mom walked towards the gate with an umbrella, to pick her up. “Daddy! Let’s go to the rainbow land”, she jumped into his arms. “First let me dry you and get you dressed”, her mom started drying her with a towel. He silently made an exit to his room. “Dad! I am ready”, she appeared in his room after about ten minutes. She was dressed in her favorite white frock and appeared like a princess. “It’s raining outside! We can’t go now. Some other day”, he said. “But you had promised”, her face dropped. “Purple!” her mom called her and took her away. He buried himself in his laptop again and tried attending his office work. “Daddy!”, he heard her exclaim. ‘She must have explained her efforts that I had put in’, he smiled faintly and silently walked towards the backyard. The kid and her mother were at the backdoor. “It’s a rainbow!” she screamed in joy. He approached them and looked towards the sky. The sun had sneaked out from his shelter and dark clouds had disappeared. In the vast canvas of the blue sky, there was the rainbow – large, arched and colored from violet to red!! “Thank your dad for the rainbow”, his wife prompted the kid. “Thank you dad”, she pulled his cheeks and planted a kiss. He smiled in joy. The mother stood there with the handy-camera, capturing the moment and smiling in content! “What story are you going to tell me today ?”, she asked him after jumping into the bed – right between her mom and dad. “I am going to tell you a story of Margaret fairy”, he said. “Margaret fairy? What does she do?” Purple asked him curiously. “She does magic”, he smiled. She stayed silent for a while and appeared to be lost in thoughts. “Daddy! Was mumma named after her?” she asked him innocently. He looked into his wife’s eyes and both smiled at each other. “You needn’t apologize Sid”, said Amulya. She was wearing a black t-shirt and pajamas. Her hair was tied to form a bun. With a serious face, she was no longer the 21 year old kid she used to be. A Lot had changed over a period of ten days. She had joined a theatre group and had shifted to a ladies PG. It’s said that there are five moments in a woman’s life, which bring in a significant change in her behaviour and outlook. The First time she gets know that some guy likes her. The First time a guy tells her that he loves her. A guy breaks her heart for the first time. That moment when she gets married. That very moment, when she gives birth to her first kid. Amulya was living in the aftermath of the third. I could rightfully take the credit for her new-found tough attitude towards life. “You must go back home. I know I disappointed you, but why are you punishing yourselves for the mistake that you haven’t done”, I tried to convince her, once again. Her parents had tried doing it every single day, but in vain. She looked at me sharply. Her innocent eyes were long gone. “Sid..! I am happy the way I am. Why are you considering it as my self-imposed punishment? Who told you that I don’t like doing theaters? I love acting. In fact, I always wanted to be an actress”, she spoke like a lawyer fighting her case. “But why a sudden interest in acting? Why didn’t you tell your parents about it, when they were planning to get you married?”, I put forth my argument. “I didn’t have courage! I am not denying the fact that you left me shattered by calling off our engagement. That wasn’t easy for me”, she paused to study my reaction. The sense of shame and guilt had swarmed over me. I looked away. “Moments like those don’t make you weak; they make you tough. It gives you enough time to think about your life. It makes you realize that you should start making decisions, instead of letting others do it for you. Let me tell you, now I have an excuse to pursue my interest. I am able to do something beyond my studies. And I am very much excited to embrace it”. “But..!”, in spite of feeling happy for her, I wanted to give my one last try. “Sid.! I am happy now. It’s a new beginning for me. Please don’t force me into my old life. I am feeling relieved that I don’t have to live with the nerd tag any more. Want to do something cool. !”, she pleaded, gently. “All the best, then!”, I wished her luck. “Thank you Sid. And chill dude!”, said she. She had intentionally played the ‘dude’ word trying to prove that she was happy. I smiled in return. I was filled with remorse and wanted to come out of it. I sincerely hoped that she is and will be happy with her life. “It’s my marriage. I want you to be there”, I said. “Wow.! That’s wonderful?”, she exclaimed. I fell silent. “Where’s the invitation card, Sid?”, she asked, this time playfully. “I will text you the time and venue in a while. Hoping to see you tomorrow”, I said. “Tomorrow? Sid..! They are picking actors for their next play. I should be here. It’s very important for me. I am extremely sorry”, she put up a sorry face. “That’s okay..! Which play?” I asked. “Based on O Henry’s last leaf”, she answered. “Good luck”, I wished her luck, with a faint little smile. I double checked the ring in the velvet box. The beautiful jewel, with a heart shaped bright white stone was shining brightly under the sun. A little girl tapped the window mildly. She was ten, I guess. I was at the signal, waiting for it to turn green. I lowered the window and she held a bunch of roses towards me. It was as if she knew my plans for the day. “Ten rupees anna”. She handed me a rose. She had a large blue polythene bag, good enough to carry over a hundred roses. “How much for the entire bag?”, I asked. She was taken aback by the huge order that I had placed. I think she wasn’t prepared for the math. She took a while before replying. “Hmm.. Don’t know uncle. Let me count”. I don’t know what prompted it, but she had switched to ‘uncle’ from ‘anna’. Seeing her struggle to count, I asked her if she knew how to count. “Not properly, anna”. The anna word had reappeared and I felt good. “Ninety. And I have already sold ten”, replied the proud little girl. “That makes it, eighty in the bag. And I have to pay you eight hundred”, said I in an attempt to teach her mathematics. She nodded with a smile. I didn’t want to give her a lecture on the importance of schooling. Not today, I thought. I took out two notes of thousand rupee. “Give me all those roses. I am going to pay you 2000 Rs. I want you to give this one note to your parents, showing it as your earning. With the other note, buy yourselves a nice little chappal and a cute little frock”, I said. I don’t know if she understood it completely and I wasn’t sure if she was convinced the thousand Rupee note. She nodded in response and handed me over the large blue bag. “Thanks anna”. She put into exercise, her dimpled cheeks. I took out a rose from the bag and gave it to her. I think she felt a little shy, so she quickly ran across the street after refusing my rose. ‘This rose thing is indeed difficult’, I smiled to myself. The signal went green, the biker behind me honked and I moved my car. I had worn a white full sleeved shirt and white trousers – Helps you with positive vibes while talking to a girl, somewhere I had read. However, when I reached the college, Mother Nature had some other plans in store. In no time, the sunny day had turned rainy. After parking the car in the parking space, I dialed her number. “Hey I am in front of your college”, I said. “And I am inside it”, she replied. “Sid..! Even I haven’t carried any! Who would carry an umbrella during summer! Moreover, it’s ethnic day. I am in saree. You don’t want me to spoil it, do you?”, she scolded me with a mix of laughter. ‘And I am in white and white. People are going to file an obscenity case against me for wearing wet white cloths”, I badly wanted to say. Intended words didn’t escape my mouth after I pictured her in the saree! ‘Wow. !’, I silently exclaimed. “Okay. Tell me where I should come”, I asked her, hiding my excitement. “4th block, third floor. Information science final year classroom”, she replied. “You got to be kidding. I am not coming to your class”, I complained like a kid. I didn’t want my proposal plans to be ruined. “Come on. It’s ethnic day. We don’t have lectures today. Everyone is busy posing for photographs”, she said. “But.. You wanted me to surprise you”, I said. All rite lady! You are asking for it. I am going to propose you, in front of your friends. Don’t blame me later, thought. “All rite! In two minutes”, I said and cut the call. Thanks to my sprint across their slushy college ground, it appeared as if I had spilled a can full of chocolate milk shake, all over my pant. My rear had got leopard prints all over it. The wet white shirt had turned transparent and I was standing in front of her classroom with a large blue plastic, torn at places. I wasn’t offering a pleasant sight. The class stood staring at me and I felt like a clown. I looked at Anahita. She was looking beautiful in her mild orange colored Saree. She had let loose her hair and had a bindi sitting prettily between her eyebrows. Her long earrings were dancing each time she moved. I am not sure if there is a research done on it, but on any given day, traditional Indian attire adds to the beauty of a woman. When the girl you love starts looking extra beautiful, it grows you nervous and makes you struggle to breath. You will find it hard to resist the urge to continue looking at her. I was struggling to breathe now. “He’s Sid, my friend”, she introduced me to her friends. I think the other group had already started gossiping. “Hi.! And she’s Anahita”, I introduced her to her friends. I thought that would make them laugh and project my humorous side. To my disappointment, none of them laughed. My confidence sunk to bottom in seconds. What was I thinking.! I felt stupid. This proposal thing is not going to happen today, not in front of her friends, I knew. “Belated wishes Anahita”, I wished her and held the blue polythene bag towards her. Few roses and stems of other few were peeping through the plastic. “A bag full of roses”, I heard some girl whispering. I could easily trace the hint of mockery in it. “So, That’s how you surprise people? With a bag full of roses?”, Anahita asked without batting an eye. “Err. Hmm. I don’t know”, I smiled like a fool. God..! Why isn’t she smiling! Didn’t she like the surprise, I questioned myself. Being in the middle of the unfamiliar college crowd was getting me suffocated. “Happy birthday again”, I said. “Got to go”, I waved a bye after realizing that I won’t be able to propose her today. Without waiting for her response, I quickly ran down the stairs. I think, I heard them all laugh. I had hardly entered the college ground, when my phone rang. The rain had refused to slow down. I ran under the tree to answer it. “Where are you?”. It was Anahita. “The green one”, I said. And before she could ask me to stop answering like an idiot, I quickly added “The one in front of the e block”. “You have spoilt your saree”, I said pointing at it. In spite of walking under the umbrella, she was completely drenched. 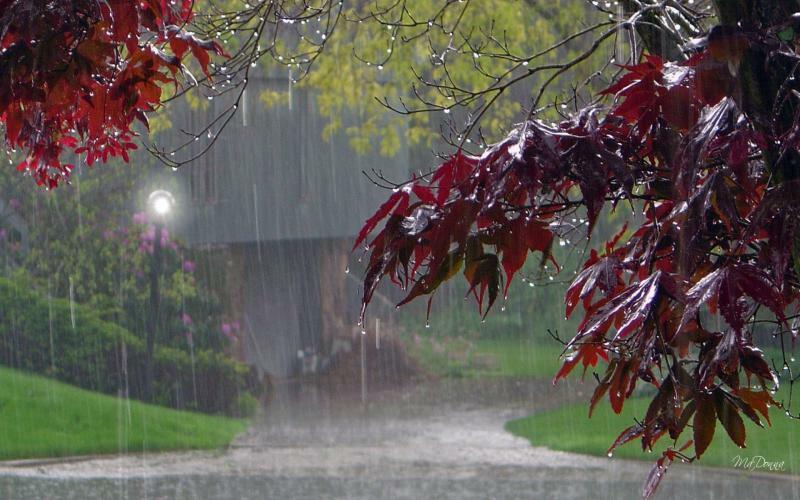 Rain was dancing in every possible axes. “That’s okay. Buy me a new one”, she said and before I could reply, she handed me over the plastic bag of roses. Rain water had formed puddles all over the ground and there was one next to us, under the tree. “You didn’t like the flowers, did you?”, I asked. “Everyone in the class is making fun of me Sid. Especially, my class guys! They think that you are my boyfriend”, she made a complaining face. The wet green leaves hanging from the tree, were kissing her cheeks. Rain drops were running down them. I cleared them for her. “Sid..! Do you want to come upstairs and flex some muscles?”, she winked. “Ah..err.. I don’t know. I mean I can. But..”, I started searching for an appropriate answer. “You are impossible”, she laughed. “You were planning to propose me, weren’t you?”, she asked. My heart skipped a beat! Was I being so obvious in the class, I wondered. I tried to smile through my nervousness. “Yes or no?”, she asked like a kinder garden teacher. “Yes..!”, I replied like a kid. The tree and her umbrella weren’t able to completely shield us from the rain. Her question and the tone, with which she asked it, conveyed something – The moment was here. I think she was in love with me. Else, why would she want to see the way I wanted propose! What kind of proposal is she expecting? I can go on knees, but what if she finds it clichéd! Parking aside my all other thoughts, I decided to start with a speech. I adjusted my hair. “Anahita..! I was always looking out for reasons to make you feel special. And I have found one in your birthday”, I started. “Oh god..! Not again. !”, she interrupted me. “This is the same speech that you gave on my birthday, right?”, she laughed. I felt surprised and embarrassed at the same time. How did she know? Did someone upload that birthday video on YouTube? I felt puzzled. “I was there. I watched the whole thing from the balcony. I was the one who had asked Sheetal to lie to you. Wanted to have some fun, you know.! I even have the video with me. My god..! That was quite a speech. And I must say, that was the most beautiful cake that I had ever seen”, she spoke with admiration. “Oh.! I am embarrassed”, I said trying to look away, in spite of feeling proud. “No. Not before you propose me”, she said. Realizing that I can’t run my well-rehearsed speech, I had to proceed to the next ritual. “I can’t go on knees. I am wearing a white pant”, I complained. She pointed at my trousers. I realized that my pant wasn’t white anymore. “Fine..!”, I relented, went on knees and took out all those flowers from the bag. She lowered her umbrella to keep me away from the heavy downpour. “Too much rain. Can’t hear you?”, she said with a naughty smile. “Anahita..!”, I added extra decibels to my usual tone. There was the sound of rain and that of mine. The stage was perfect. “I hope no one is watching this”, I spoke in anxiety. “No stupid. Do it fast”. That was the first time that she had called me stupid. I felt good. “Okay listen.! I am deeply and madly in love with you. You might not be the most beautiful lady out there, but I know that you will be my most perfect partner. I don’t want to be your boyfriend Anahita, but I want to be your lover. I don’t know the difference between two. But, I do know that I want to be with you, forever and ever. Someday in the future, I do want to marry you. And before my speech gets anymore filmy, boring and lengthy, and before I blabber some more nonsense, I want you to tell me that you love me. I want you to accept these roses, before my knee starts complaining”, I ended my one minute speech. “Wow. This would be one of the most unromantic proposals ever made in the history. And with those wild thorns, your rose garden looks dangerous to touch”, said she and held the plastic cover towards me. I was on my knees, wearing wet white cloths, completely soiled; under the tree; holding a bunch of more than hundred roses, wildly arranged. In front of me was a girl whom I loved, standing under the rain holding a blue colored umbrella and a large polythene, signaling me to put all those roses in it – She was right..! This was one of most unromantic proposals that the world had ever seen. “Everyone cannot have a perfect filmy proposal Anahita.! But I will try my best to ensure a perfect life ahead..!”, I said. “I love you Sid.. and would love to stay with you, forever and ever”, she said with a sweet smile. Is that all? Isn’t she going to tell me why she loves me.! – I felt disappointed. “Wow. That was cute. So can we kiss now?”, I asked. I think, I should have looked into her eyes and let that thing happen automatically, instead of seeking her permission. “I think you watch too many movies. This kiss thing is not going to happen with me, not until we get married”, she said. This sounded disappointing less and cute more. “In that case, I don’t care if we are going to have an orthodox Hindu wedding. But when we do, I am going to ask one of my friend to conduct the ‘now you may kiss the bride’ ritual, right after I tie the mangalsutra around your neck”, I laughed. “I am not going to oppose mister”, she said, this time in a loud voice. I quickly remembered about the ring. “Hey.. I have carried a ring too. Shall I put it around your finger?”, I asked and held out the ring in front of her. “Oh my god..!”, she clasped in excitement and I stood up with a confused face. “For few things, one must not seek permission”, she said, trying to hold back her tears. You can never know the kind of things that will run a girl into tears. She was immensely happy and emotional. “But the kiss..”, I was about point out that she had denied me a kiss. “Sid..! I said ‘few things’. And the kiss is definitely not amongst them”, she sneezed again. “I will be waiting for the day we get married Anahita”, said I and put the ring around her fingers. The rain continued to lash, heavily. And I stood there under the tree, with the lady I loved, being the happiest man on the earth. My dad placed the silk pheta over my head and my mother adjusted my tie. “Shall we?”, asked Amit. I nodded and he signalled the nurse to open the door. I slowly entered the room. There were around fifty people in that large room of the hospital – friends, relatives, employees of my company and hospital staffs. Anahita was on the bed, next to the wall. She was on artificial ventilation, with her eyes closed. She had suffered a spinal haemorrhage. The loss of blood was immense and had refused to stop. Doctors had given up and she was counting her final moments. Live in the present, make those final moments count. Make them beautiful and worth cherishing.I didn’t think twice before deciding to marry her. On my request, my dad had asked the hospital administration to allow us carry out the ceremony in that room. I wanted it to be special and romantic– something which Anahita always wanted. I had the whole hall filled with white flowers. Everyone was dressed in white. Large photographs of her, capturing those beautiful moments of her journey – from childhood till date, were adorning the walls. I looked at my watch. It was five forty in the morning.! In spite of being an early morning affair, I could see that no one had strained eyes. Anahita’s mom offered me topor, the turban worn by the groom in Bengali weddings. I handed over my pheta to her and bent my head. She placed the topor on my head. After taking blessings from my parents and her mom, I went up to her cot and stood next to it. The whole hall was silent. I was perhaps the only person in the hall, who stood smiling. “It’s good to see you all here. Means a lot to me”, I thanked everyone in a calm voice. “It doesn’t happen in Hindu marriages, but I want to deliver a short speech before I get married. You might feel that few things are being overdone and few other things might sound dramatic, but I want you people to know that, it’s important for me. It’s important for us. Please bear with it”, I added. “The moment is finally here Anahita. We are getting married”, I said and my voice choked. I wiped my tears and reminded myself to stay in the present. “Every guy on the earth claims to be lucky, when he gets married to his lady love. But let me draw an exception”, said I and looked at her. All the calmness in the world was resting on her face. The nurse standing next to her was smiling through her tears. “You are the luckiest woman in the world. You are getting married to the one who loves you the most.”, I paused again. “On this day, I needn’t tell how much I love you. Because, you know about it and I don’t find a need for the world to know it. On this day, I don’t want to tell why I love you. Because, everything about you is equally specially to me. However, I do want to tell something. Something, which the world might find uninteresting, but you will definitely appreciate”. The time read six. I signaled the staff and they slowly opened the windows of the hall. First rays of sun made their way to the hall and to the beautiful garden outside. Strokes of cold breeze traversed through the window. Birds started singing the music of the hour. “Dew drops, sunshine and a blade of grass.! Few days back you had asked me the meaning of it, when I floated those words in front of you. That moment, I had no answer. But Now , I do have one. The grass stays on the ground till it dies. Sun has been maintaining it’s routine for years. Dew drops make their presence felt in the night and starts disappearing with the first stroke of sunlight. Everyday sun wakes up to tell us that it’s a new beginning. That very moment, you neither think about the past, nor worry about the future. You live in the present, you live the moment. That very moment..,where dew drop, sunshine and blades of grass meet up for the only time in the day. It comes only when your day begins, signalling a beautiful beginning to a new chapter. The words ‘dewdrops, sunshine and a blade of grass’ will not make any difference to those who have not seen it. But those who have lived the experience, can understand the beauty behind it”, I said and pointed towards the window. Everyone in the room looked in the direction. The tender rays of sun were amplifying the beauty of the moist green plants in the garden. The white flowers in the room, the greenery outside and the orange tinge from the sun light was dressing up the whole scene. It was grandeur in all its serenity. “On this day, I want to tell you that our journey together has had several such chapters with beautiful beginnings”, my voiced choked again. Once again I asked myself to stop picturing a life without her. “I want to tell you that this is once such new chapter in our life. A new chapter with a beautiful beginning. ! This day when I am marrying you, I want to tell you that this would the most beautiful chapter in my life, which I will cherish till my one last breath. Wishing both of us a happy married life”. I was done with whatever I had to say. I don’t know if she was able to hear all that I said. But it didn’t matter. She already knew the only thing which I wanted her to know – that I love her. Anahita’s mom handed me over the mangalsutra. The lady doctor and my mom along with a nurse approached the bed. They slowly lifted her head and I tied it around her neck. Amit stepped forward. “Now you may kiss the bride”, he said. I smiled at him and bent towards her. I closed my eyes and placed a peck on her lips, though the ventilation mask. A tear silently slipped from the corner of her eye, down her cheeks! “I must say, that was quite a wine. I really appreciate the way you have dressed up the whole reading section. And I love the name that you have given to this place. It’s beautiful”, said the old man in his sixties. He was sitting in my cabin. He was a retired journalist. “Goaaaal….! !”, the loud cheer from the other hall breached its walls, reaching us feebly and I smiled.!! On the top of the hill, all alone..! Arms outstretched, eyes closed and feeling the breeze against my skin! The first ray of sun kissed my skin and made it warm. I knew at once – A new day was here..! Punctual as usual and being pleasant as ever! I opened my eyes and looked all around..
Dewdrop, sunshine and blades of grass..!! 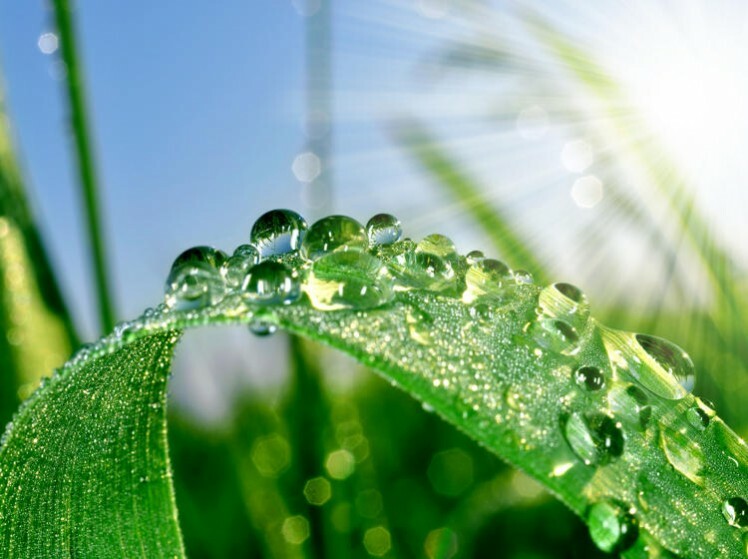 Dewdrop, sunshine and a blade of grass..!! Thank you for reading. I cannot be sure that you have enjoyed this series, but I sincerely hope that you did. I would also love to hear your feedback. You can provide yours by commenting here, or dropping an email to chandrajith.pb19@gmail.com.